Years ago, our first rental home came complete with acres of wood paneling to admire. I couldn’t get past the stretches of faux walnut wood and used a lot of alone time during my husband’s deployment to prime and paint just about every inch of it. The paint was so much better, except for one part. Although the green color I chose was amazing, it was just too much for the large, long walls. The expanse of the Martha Stewart inspired hue reminded me of the Green Monster, Fenway Park’s beloved but enormous left field wall. I do enjoy baseball, but I wasn’t THAT big of a fan. I quickly had to figure out what to do with the space to make it work. I refused to repaint the miles of greenness, so I got creative and it all worked out thanks to strategically placed artwork and a baker’s rack that you buy when you first start out because it seems like a grown-up piece of furniture to put in your less than stellar rental house. After years of experience trying to make rentals livable, I’d like to share some of my tricks for filling those enormous and blank wall spaces in your home. There are several ways to do this, but a good place to start is to determine if you need a workspace for a home office or study area. Positioning a desk with some shelving easily gives this portion of a large wall purpose. Another way to break down the space is artwork and small vignettes of furniture. 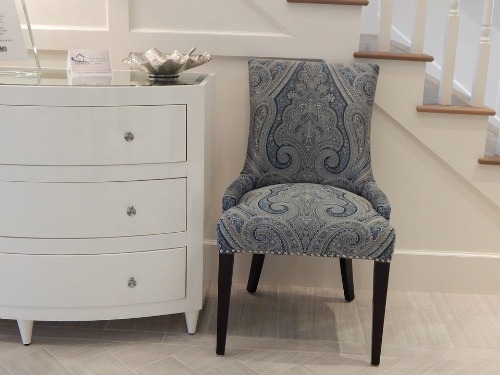 A favorite photo with a small end table and chair will shout reading nook. Most homeowners bemoan the lack of storage space in the house. 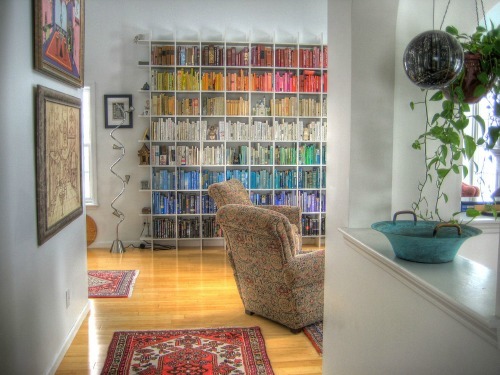 This photo shows how to make a personal library a piece of artwork while managing a life time of book collecting. Although this example is extreme, a wall-size entertainment center with carefully collected items will become a gallery for precious pieces while, at the same time, hiding any unsightly electronics. Dark walls will usually close in a space. 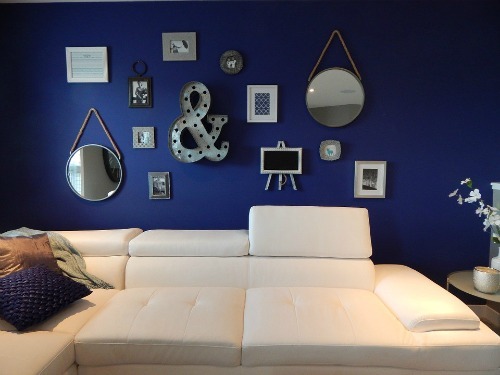 The purple-navy color here works visual magic by reducing the look of a large space. However, the illusion is only completed with the contrasting white sectional and the strategic placement of the wall gallery of artwork. 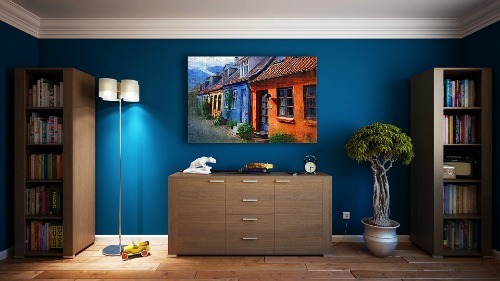 Speaking of paint, many types of paint techniques will distract the eye from a large stretch of wall. Depending on the dimensions of the room, wide vertical or horizontal stripes could trick the mind. This is after careful consideration, of course. You don’t want the room to look like a circus tent. Painted squares or rectangles acting as framed out space for artwork or hanging collections (shelves, quilts, baskets, pottery) highlight pleasing items, instead of the awkwardness of too much wall space. I am happy to report we no longer live in the house with the Green Monster, and the paint project was a great investment in my decorating education. No one really even mentioned the green space until I pointed it out and made the reference. Just goes to show how something can really bother the person who lives there, but never crosses the mind of visitors! Continue to read on with MilitaryByOwner for more updates on how to decorate rentals that will have to work until you can search for your forever home!